Communications Structures provides management services for various owners of communications towers, monopoles, and building rooftops. These services include lease negotiation and management, collection of rent, monitoring of sites, and general tower maintenance. CSMI works with providers to find sites that meet their service needs. We serve as the contact for co-location leases and coordinate installation of equipment at the sites. 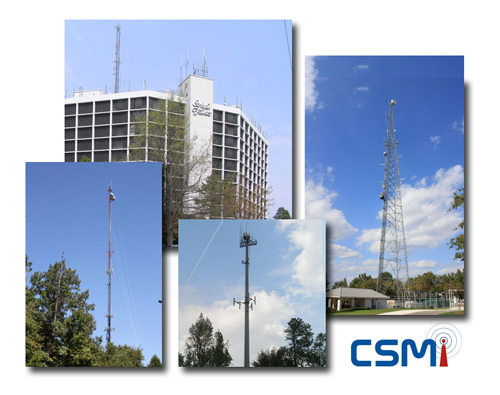 CSMI has been in the business of managing communications structures for over 20 years and serves tower owners from the coast to the western Piedmont of North Carolina. Communications Structures Management is a leading independent owner and operator of wireless communications infrastructure. CSMI employs a comprehensive site management approach that provides a seamless collocation experience. We have a 20 year, proven track record of superior service to both our clients and the tenants that they serve. See the BENEFITS OF CSMI MANAGEMENT.